1969 Farrelly Side Slipper 6 ft 7 1/2"
Foam blank with 1/8'' redwood stinger, Volan glass with blue tint, resin pinlines and decor, fin box. Bottom: flat , vee behind fin. Rails: 50/50 in nose and soft down rail from 1/3 rd back, harder in the tail. Possibly not original, the fin has been resined into the fin box. Note red pinlines indicate factory setting. Originally a Midget Farrelly design, to allow fin variation and placement. Deck: Farrelly and address - black script at centre. Catalogue No. 9 : FARRELLY 6 ' 6'' "SLIPPER" DESIGN 1970's Blue with white pinlines, out there! Catalogue Notes by Mick Mock, PO Box 330 Manly NSW Australia 2095. 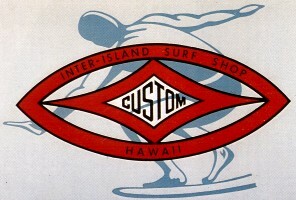 The Side-Slipper was a stock design for Farrelly Surfboards in Nov 1969, along with Midget Farrelly's Rounded Pintail and Squaretail 'White Kite' designs. At a cost of $125.00, it was a premium product trading on Midget Farrelly's designs and an immaculate finish that set the benchmark for the rest of the industry. (Surfing World Magazine January 1967 Pages 15 to 21). is by far the most efficient, most difficult. If performed correctly, it can eliminate a cutback. Everyone has experienced a fin drop-out and its main effect - loss of forward motion. When emerging from a hot hollow section it's possible to remove the fin from the wave intentionally, and establish a sideways drift towards the beach. As the wave recovers and starts to wall, drop the fin in by back-peddling, recover some sort of trim, and move out. Nat Young and I spent two days at Noosa working on this, succeeded about four times each. The big problem is knowing just when the fin is going to break out. We are working on special nose and fin shapes for this purpose." 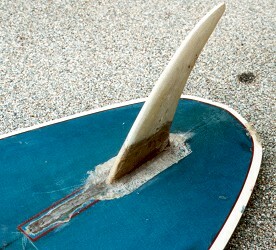 IMPORTANT : Not to be confused with "slipping the board " - a nose riding manouvre taht does not dis-engage the fin. As demonstrated by Miki Dora in Bruce Brown's The Endless Summer, 1964. SIDE SLIPS can be performed anywhere on the front half of the board. They throw the board out of an inside rail stall, and set up a highly efficient trim for half a second while the board is banked outwards. This half second or so allows the board to leap forward. The acceleration is noticed as soon as the sideslip is checked, and the momentum gained from the small drop is redirected. Side slipping became an recognised manourve in 1969, as demontrated in John Severson's Pacific Vibrations, 1970. Particually well executed by Jock Sutherland, the film also featured extreme spinning 360's.. Image left :(Wide tail) Inter-Island Flip Tip. What Reno rode in '69! Reno Abellira and Inter-Island Side Slipper with hyper-kicked nose, Huntington Pier, California, 1969. To initiate the side slip the fin had to be dis-engaged, so the design critically relied of using smaller and inter-changable fins. Fin boxes were virtually a required addition. This demand encouraged research into fin boxes and by 1972 the Bahne system became an industry standard. Subesquent to this design down soft rails became an industry standard. A hyperkicked nose reduced the chance of burying the nose and helped in recovery. Nose lift and bottom rocker variations would be extensively explored by designers for the next 30 years. 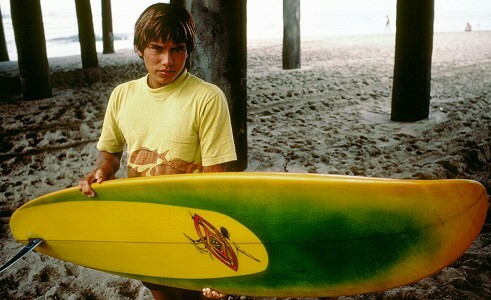 In Australia the design was taken up by Midget Farrelly (Farrelly Surfboards) and Terry Fitzgerald at Shane Surfboards. The only board that allows the surfer to ride sideways, backwards or in a spinning circle. Speed comes easy, control is super positive through the flat bottom and low, soft rails. Basically, the board is longer, thinner and a diamond shape in outline. The fin is smaller to facilitate release only when desired. The rails amd bottom allow a shallow draft fin in any case, and the fin used is both adjustable and removable. Midget has ridden this shape in most every kind of wave. Reef surf was where the speed from the bottom and the rails was best put to use. In beach break the board responded to all manouvres and created new freedoms with side slips to hold curl position and 360's to fill the gap between peaks of sections. Fantastic sensations can be had riding whole sections backwards. The most average surfer is going to find this surfboard easy to ride. Thje side slipper can't be compared to any other board that has gone before it. The only limitation this surfboard has is the surfer who rides it. Farrelly Surfboards, 230 Harbord Road, Brookvale 2018 Phone : 939-1724. 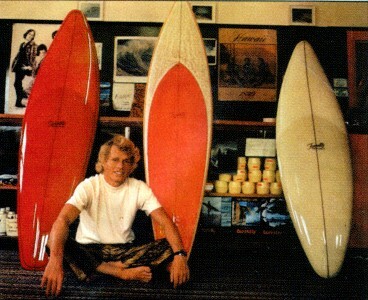 Farrelly Surfboards Advertisment, circa 1969. Re-printed in Walding, page 76. Note : - The red board on the left has a much wider tail than the two to the right. The validity of slide slipping as a manourve was hotly debated and at the 1970 World Contest it appears that the the judges were not impressed. 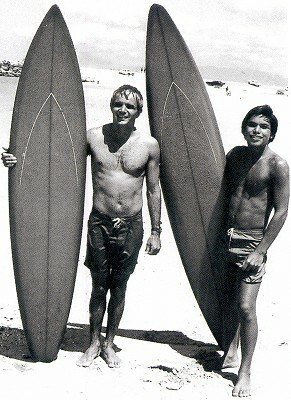 "were riding side-slipper boards shaped by Ausie legend Midget Farrelly." -Tomson: Bustin' Down the Door (2008), page 18. Although Reno Abellira and Midget Farrelly rode Side Slipper designs, there are no contest photographs of them (or others) side slipping. The situation is similar in Paul Witzig's Sea of Joy, 1971. Due to the lack of suitable wave conditions, the required high skill level, the potential for confusion in crowed conditions and/or the rejection by contest officials: side slipping receeded dramatically. - down soft rails became an industry standard. - encouraged research into fin boxes ( by 1972 the Bahne system became an industry standard). The manouvre, despite all predictions, would re-appear in the late 1980's initially as the Floater, credited to Mark Sainsbury. In an extended re-entry the ridder dis-engages the fin and slides the board across the back of the crest. Such a manouvre was unthinkable in 1969 without the performance, particually the recovery control, provided by Simon Anderson's Thruster. Along with the development or "getting - air " , modern surfing (circa 2004) commonly incorporates variations of the side slip. Due to the ten year gap, the connection between side slipping in the 1969 and the 1980's was, understandably, largely ignored by commentators. John Severson : Pacific Vibrations, 1970.